We are currently not posting on our blog while we update all of our web content and videos. For day to day updates go to our twitter feed @forexearly. The EUR/AUD is forming a new uptrend on the D1 time frame. Traders can set a buy alarm at the 1.4775 level. The upside potential on this new trend is as high as the 1.5500 resistance level, so entering this trend has excellent upside potential. When the price alert hits check The Forex Heatmap® for trade entry verification signals. 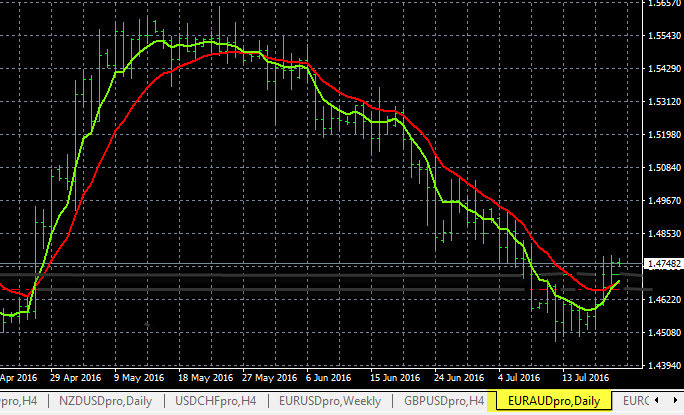 The trend charts you see for the EUR/AUD are exponential moving averages which are easy to set up. These trend indicators can be used to follow the major trends of the forex market and our trend based trading plans. Today in forex trading the GBP (British Pound) was weak on all pairs in the group and this drove very strong price movement. 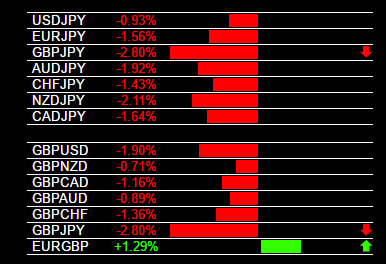 The live trading signals for the GBP and JPY (Japanese Yen) pairs are shown below from The Forex Heatmap®. The GBP/USD and GBP/JPY had very strong sell offs and broke through short term support levels and into their long term trends. 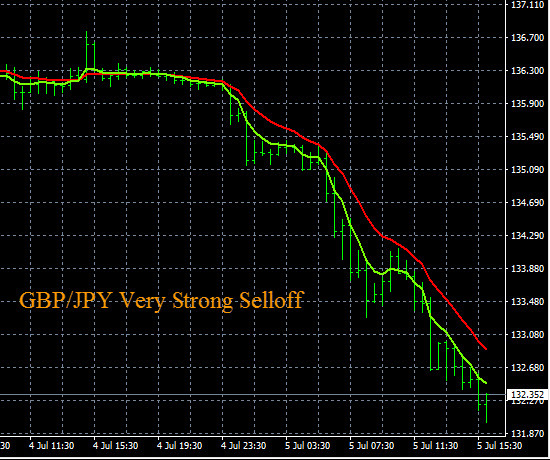 The NZD/JPY also sold off on the overall JPY strength in the market today. The GBP/JPY and GBP/USD are in strong downtrends and both pairs are at post-Brexit lows, and the GBP/USD is at a multi year low. We see a lot more sell potential ahead on these pairs. The Forex Heatmap® provides live buy and sell signals for 28 pairs. You can see the signals from the JPY and GBP pairs in the images below along with the nearly 400 pip sell off in the GBP/JPY. 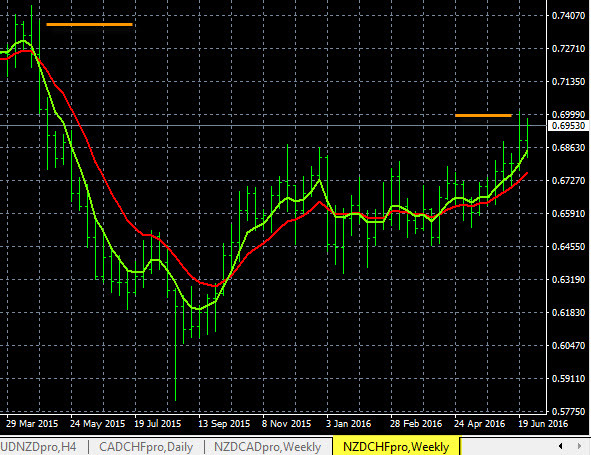 The NZD/CHF is trending higher on the W1 time frame. Traders can set a buy alert at the 0.6985 resistance area, which is noted on the chart. When the price alert hits price check The Forex Heatmap® for a confirmation buy signal. The NZD/CHF has great upside pip potential past the alert price up to the 0.7400 area resistance level, noted on the trend chart below. So the overall pip potential is about 400 pips, which means the risk to reward ratio and money management ratio for this trade is excellent. We conduct all of our trend analysis using multiple time frames of trends. We isolate each currency like the NZD and CHF plus six other currencies and analyze them separately to determine the trend and overall plan of entry. This video will show traders how to set up metatrader profiles for easy analysis of individual currencies. This will enable traders to group pairs by individual currency, following the principles of parallel inverse analysis. Setting up a metatrader profile for individual currencies mimics The Forex Heatmap® and our market analysis spreadsheet. You can set up each currency group of 7 pairs in one MT4 profile, set up one profile for the USD pairs, one profile for the JPY pairs, one profile for the AUD pairs, etc. Then you can access each metatrader profiles template quickly with one mouse click for analyzing an individual currency across 7 pairs. Setting your trend indicators up this way allows you to see the market movements if a particular currency is consistently strong or weak. If the Euro is strong, for example, you can see at a glance if all of the EUR pairs are moving higher. Following the logic of the market is easier with this setup. This is the best MT4 chart template available to forex traders, because you will always know why a group of pairs is moving up or down. This video will show forex traders how to set audible forex price alerts on the metatrader charting platform. This will allow traders to monitor any currency pair for price breakouts or trend continuations after consolidation phases. First, a trader should locate a trend on the larger time frames for a trend continuations or breakout point. Then you locate the breakout point on the short term support or resistance levels on the smaller time frames, like the M5 and M15 time frame. Next, traders can set an audible forex price alert at the short term levels to intercept the next price movement. Then the video will illustrate the mechanics of setting the price alerts for any pair. When the price in the alert is hit, the audible alert will notify you of the price breach on your desktop, and it can also be delivered by email to your email box or mobile device. Then you can check The Forex Heatmap® to verify the trade entry. This is one of our alert systems, we have several forex alert systems so you always know when the forex market is moving. Today in forex trading the CAD (Canadian Dollar) was weak, the NZD/CAD and AUD/CAD moved strongly higher. 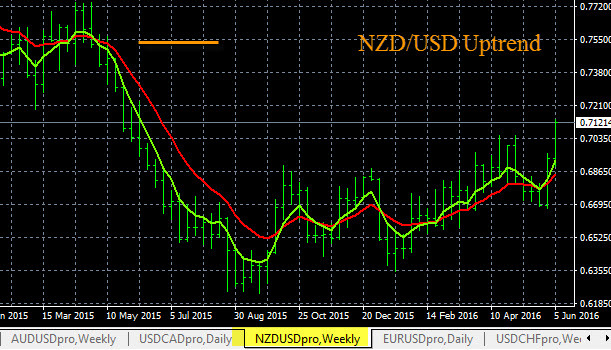 The NZD/CAD is trending on the W1 time frame in place, and has additional upside potential. 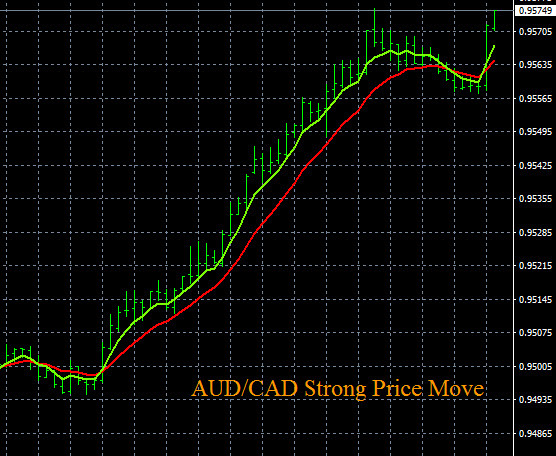 The AUD/CAD had a strong overnight movement and has broken one resistance level on the D1 time frame. Both of these pairs have ongoing upside potential and we will look to continue to write additional trading plans for buys over the next few days. The AUD/CAD has hit a high of 0.9575 in intra day trading, and the NZD/CAD has hit 0.9090. The NZD/CAD has potential up to the 0.9400 area on the W1 time frame trend. The live trading signals you see below are from The Forex Heatmap®, which provides live buy and sell signals for 28 currency pairs. The heatmap give traders guided trade entry points for trending pairs and day trades. This video will introduce forex traders to the complete trading system from Forexearlywarning, along with an overview of the major system components. This video will explain how we prepare our daily trading plans for 28 pairs, what trend indicators we use, and how we enter trades. We will review all of our alert systems and signal systems, like The Forex Heatmap®. We will also explain our techniques for how we manage money and profits, prices for our services, and the best way to get started. Forexearlywarning provides ongoing support to clients with our weekly forex webinars, along with email, phone and Skype support. The video will reference the Forexearlywarning website to answer these questions and to provide you with a guided tour. This video will show traders how to set up our free forex trend indicators. You can use these indicators for multiple time frame analysis to analyze 28 currency pairs across the 8 different currencies we track every day. You can also use these indicators to follow our trading plans. This is our “basic” trend indicator setup, some of our other videos will give you other options that fit our trading system. This video is only 4 minutes and will show you how to set up one pair, then you can duplicate the procedure for 28 pairs. The setup is for the Metatrader (MT4) charting platform using the basic chart window, simple open, high, low, close barcharts and exponential moving averages. It will show you color settings and how to zoom and magnify the time frames. Using this procedure you should be able to set up 28 pairs in about 20 minutes. Just click on the link if you would like we also have some written instructions to set up these free metatrader trend indicators. Here is our current trading plan for the NZD/USD pair. The NZD was strong in the Asian session today so after this pair consolidates, we will set a buy alert at the near term resistance, just past 0.7130. When the price alert hits check The Forex Heatmap® for a confirmation buy signal. Current pricing is around 0.7120, overall pip potential is up to the next major resistance at 0.7550, shown on the chart. This is about 400 pips of potential, sour our money management strategies like risk reward ratio is pretty solid. We suspect we will be issuing several trading plans based on NZD strength and other pairs in the NZD group tomorrow in our daily trading plans.